An early challenge for the Buccaneers’ passing game The Tampa Bay Buccaneers stormed into the 2018 NFL season and rolled over a New Orleans Saints defense which was widely expected to be excellent after they posted an 84.1 team defense grade in 2017, 11th-best in the NFL. The best way to do that is through the pass-rush, as Luck posted just a 25.7 passer rating under pressure last week. Last year as a rookie, Smith played 591 offensive snaps and finished with an overall grade of 53.6 that ranked 48th among tight ends. McCaffrey averaged five yards per attempt (and 2.6 yards after contact per attempt) but was at his best in the passing game (87.3 receiving grade) – catching six of nine targets and gaining 46 yards after the catch. In limited action in Week 1, Allen struggled under pressure, completing only two of seven passes for 38 yards, and a passer rating of 49.7. Among 31 running backs with at least ten rushing attempts last week, Conner finished fifth with a run grade of 69.4. The Cardinals would be wise to increase Johnson’s targets against the Los Angeles Rams in Week 2, as the Rams allowed the Raiders running backs to catch 13 of their 15 targets on Monday night. Finishing with a 65.2 grade, Garoppolo ended up with a 45.5 completion percentage and three interceptions to his one touchdown. However, as impressive as he was in the running game, Barkley somewhat struggled in the passing game, catching just two of six targets for 22 yards. Against the Broncos last week, Marshall and Lockett both caught a deep pass for a touchdown, while Dissly finished sixth amongst all wide receivers and tight ends in the league in yards per route run at 5.25. The first full week of the regular season has come and gone, bringing with it several standout performances from rookies and veterans alike. There were some upsets, and there were some surprises performances, but there were also some severe injuries that could make a real difference to the result of the season. Rookie cornerback Denzel Ward is coming off the highest Week 1 game grade (86.4) by a rookie cornerback since Jason Verrett (89.2) back in 2014, and that is all while beginning his career opposite a perennial “elite” wide receiver in Antonio Brown. Brown was targeted seven times while being covered by the rookie in Week 1, and Ward was able to earn a positive coverage grade on three of those targets, which is tied for the second-most by any cornerback covering Brown since Week 1 of last season, behind only William Jackson’s unbelievable six. The standout rookie’s 86.4 coverage grade will be put to the test again with a matchup against two fellow former Buckeyes in Michael Thomas and Ted Ginn Jr. on the horizon. The duo combined for 21 receptions on 23 targets for 248 yards and two touchdowns in the shootout last week against the Buccaneers. 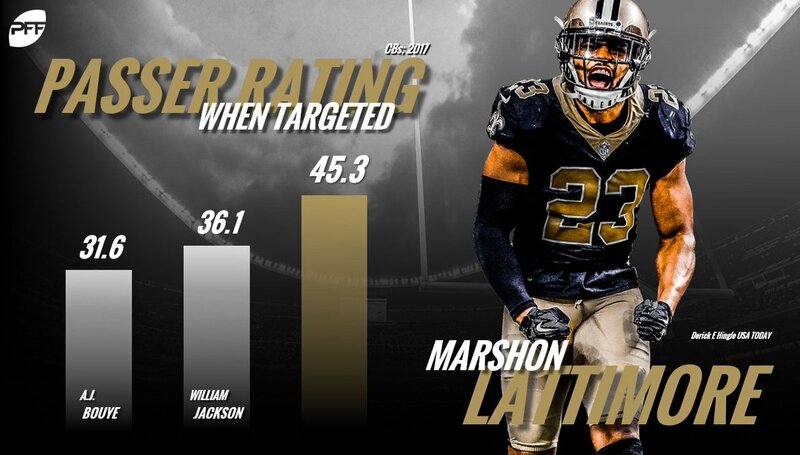 The Saints’ 2017 rookie class was the talk of the league last season as it included the offensive and defensive rookie of the year winners, running back Alvin Kamara and cornerback Marshon Lattimore. However, Lattimore would probably like to leave Week 1 in the past, as he earned the lowest game grade of his career (44.8) while shadowing Mike Evans on 82.8 percent of his routes run. Last week, the former Buckeye allowed his first touchdown and yielded his second 100-yard receiving game to a wide receiver, along with allowing passer rating of 149.3. With the Browns on the horizon, Lattimore will go from the highest-graded passer of Week 1 (Ryan Fitzpatrick, 96.6) to the second-lowest-graded passer of Week 1 in Tyrod Taylor (42.9). Lattimore will look to return to his 2017 form where he allowed a mere 45.3 passer rating in coverage, the third-lowest in the league. As Carson Wentz continues to sit out and rehab the torn ACL that he suffered last season, Nick Foles will remain the starting quarterback for the Philadelphia Eagles in their Week 2 matchup with the Tampa Bay Buccaneers. 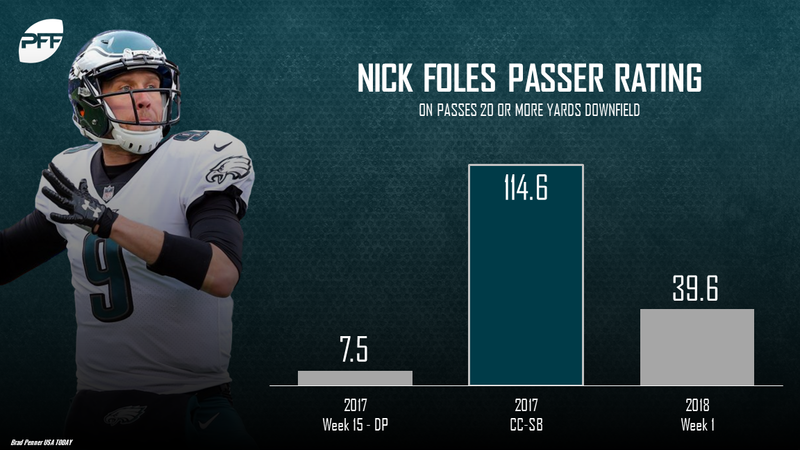 Foles has been at both extremes of our PFF grading scale in his recent stint with the Eagles. After replacing Wentz in Week 14, Foles struggled in weeks 15 through the divisional playoff matchup with the Atlanta Falcons, receiving an overall grade of 45.3 over those four games. As everyone knows, though, he turned it around and put together an excellent performance in the NFC Championship and Super Bowl, receiving an overall grade of 95.3 over those two weeks. What was the difference? His deep passing improved dramatically over the final two games. In Week 15 through the divisional playoffs, Foles went just 1 for 13 on passes 20 or more yards downfield for a passer rating of 7.5. In the NFC Championship and Super Bowl, Foles went 8 for 12 on deep attempts with four of those going for touchdowns. Unfortunately for Eagles fans, that version of Foles did not return in Week 1 against the Falcons, as Foles received a game grade of 55.6 and did not connect on any of his five deep attempts. He will look to get the deep ball going this week against a Buccaneers defense that just lost starting cornerback Vernon Hargreaves. The Tampa Bay Buccaneers stormed into the 2018 NFL season and rolled over a New Orleans Saints defense which was widely expected to be excellent after they posted an 84.1 team defense grade in 2017, 11th-best in the NFL. DeSean Jackson and Mike Evans were the primary beneficiaries, posting overall grades of 94.8 and 91.9 respectively, while Ryan Fitzpatrick paced the league among quarterbacks with a 96.1 overall grade. DeSean Jackson might miss the Week 2 matchup with the Philadelphia Eagles, so Chris Godwin is likely to see increased usage in his absence, as will tight ends O.J. Howard and Cameron Brate. Continued offensive execution could be necessary for a win, as the Bucs posted a 55.5 overall grade defensively, 30th of 32 teams. When Indianapolis Colts quarterback Andrew Luck was picked off on his first drive in return from a lengthy shoulder injury, many were quick to say he wasn’t the same quarterback who posted a 90.4 grade in 2016. From then on after the interception, Luck was just stellar. 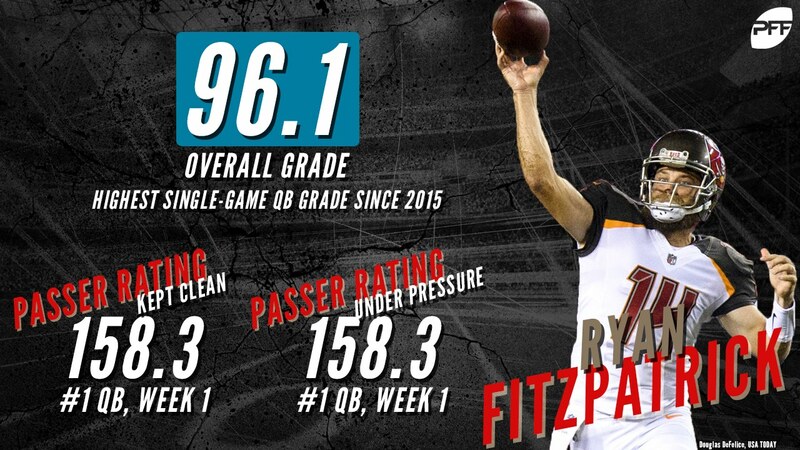 He earned an 82.3 overall grade — sixth among quarterbacks — and also finished sixth in adjusted completion percentage at 82 percent. However, Luck understandably wavered under pressure, posting just a 25.7 passer rating on his pressured plays. Aside from getting used to performing under duress, Luck will also need to get back to his deep-throwing ways. In 2016, 13.6 percent of his throws were 20 or more yards downfield, but in Week 1, only 5.7 percent of his attempts were thrown 20 yards or more — third fewest among quarterbacks. Just as Luck got more comfortable after his interception, he’ll want to show his Week 1 performance is merely the beginning of his road back to glory. He’ll get a good test when he faces a Washington Redskins secondary that shut down the Arizona Cardinals’ offensive weapons. The Washington Redskins’ win over the Arizona Cardinals wasn’t flashy, but it was refreshingly efficient. Their defense is loaded, and it showed in the secondary as no cornerback allowed a passer rating higher than 45.0. Combine that with quarterback Alex Smith’s adjusted completion percentage of 80.8 percent (7th among quarterbacks), and the Redskins secured their first season-opening win under Jay Gruden. But there’s no reason to stop there — a team that can perform as cleanly as the Redskins can compete with anyone in the league. Their next task is to hinder Indianapolis Colts quarterback Andrew Luck. The best way to do that is through the pass-rush, as Luck posted just a 25.7 passer rating under pressure last week. Miami finished the first week of the season ranked fifth in the NFL with a 73.1 overall grade on offense. While wide receiver Kenny Stills was the star on against the Titans (caught four of five targets for 106 yards and two scores), first-round draft pick Minkah Fitzpatrick earned the highest grade on the team (75.6) playing in 44 of the team’s 69 defensive snaps. Heading into New York for a Week 2 matchup with the Jets, Miami will be looking to control the pace on offense once again at the line of scrimmage. In week one, Miami’s offensive line ranked seventh in the league in overall run-blocking grade and ninth in overall pass blocking. If the ‘Fins stay competitive at the point of attack as they did against an impressive bunch in Tennessee, there’s no reason that quarterback Ryan Tannehill (11th in league in adjusted completion percentage after Week 1) and running back Kenyan Drake (46 snaps in week one on 62 possible plays) shouldn’t produce impressive results. The Sam Darnold era began with an image Jets fans are all too familiar with; their quarterback threw an ill-advised pass, the defense picked it off and returned the interception for a touchdown. “Here we go again” cried Jets fans everywhere. But Darnold proved to be resilient after his early miscue, tossing darts all over the field to dismantle the Lions secondary, and leading the Jets to a colossal primetime victory. Darnold was brilliant when passing from a clean pocket with an 88.2 percent adjusted completion percentage (5th among all quarterbacks) and a 123.4 passer rating (8th). Quick passes were Darnold’s bread and butter as he compiled an astounding 142.2 passer rating on throws in 2.5 seconds or less from snap to attempt. Throughout the victory, Darnold demonstrated a strong rapport with receiver Quincy Enunwa, targeting him on a staggering 9/20 routes run for a stellar 123.8 passer rating and 3.15 yards per route run (11th among all receivers). The Dolphins 25th ranked pass coverage unit is next on the schedule as Darnold looks to build on an auspicious debut. After his rookie season was cut short, Deshaun Watson‘s long-anticipated return didn’t go as planned. On 42 dropbacks, Watson recorded a passing grade of 62.5 that ranked 21st among signal-callers. One area in the passing game where Watson did make a big impact for the Texans was on RPO’s. This past Sunday, Watson went 3-of-3 on RPO passes for 31 yards and his passing grade of 90.8 on those throws was far and away tops among quarterbacks in week one. Against the Dolphins in Week 1, the Titans had to defend four RPO pass attempts. Ryan Tannehill completed all of them for 28 yards. With two of Watson’s RPO attempts coming on first down last week, the Texans could resort to that more this Sunday as they look to recapture the potent offense they had with Watson at the helm in 2017. After losing Delanie Walker to a gruesome injury, the next man up at tight end for the Titans is Jonnu Smith. Last year as a rookie, Smith played 591 offensive snaps and finished with an overall grade of 53.6 that ranked 48th among tight ends. Over that same period, he averaged 1.03 yards per route run compared to the 1.83 Walker had. While he didn’t get to show it much as a rookie, Smith at Florida International had 0.31 missed tackles forced per reception; a figure that was second among all college tight ends with 75-plus receptions from 2014-17. With Walker set to be 35 at the start of the 2019 season and the unfortunate nature of the beast, a strong showing from Smith could lead to him being the Titans top option at the position for the foreseeable future.